In the final part of this series on the Magic Mountain of German Literature, I asked British publishers of German Fiction for their recommendations and grabbed hold of a couple of authors too. The resulting eclectic mix of classic and contemporary recommendations, some of which won’t be appearing in Britain until next year, should keep us all busy reading German literature for many months to come. Regi Claire: Swiss Author of Fighting It! I read Goethe’s Elective Affinities (publ. 1809) while still a student, quite a few years ago now. The novel has stayed with me, perhaps because it’s such a good read and is what I would call a perfect novel. It’s also an experimental novel, in the sense that it explores the idea of elective affinities as observed in chemistry. The relationships of the four main characters are developed within the force field of freedom/choice and necessity/fate. The landscape, recurrent motifs and powerful imagery mirror the underlying theme to perfection. There’s love and passion. There’s adultery in the mind, with very disturbing results. And there’s disaster – an almost Greek-style tragedy of destiny – and death. Where is Hollywood, I ask? Alessandro Gallenzi: Many of my favourite books are German classics, such as Goethe’s Faust, Hölderlin’s poems or Chamisso’s Peter Schlemihl. But if I had to choose one, I’d say Kafka’s lesser-known Dearest Father, a touching account of the turbulent relationship between an unflinching parent and a sensitive child, which offers a new insight into the private world of one of the most influential and enigmatic writers of the twentieth century. Elisabetta Minervini: I must admit all my German readings go back in years to when I was at university (20 years ago). I haven’t be reading much recently. I remember though enjoying The Marquise of O by Heinrich von Kleist for its psychological drama and subtle comic moments. I quite liked the way the characters were caught in the bizarre and unpredictable chain of events. The all sexual drama and the absurdity of the situation made this book very modern for me. Really a compelling read. I recommend Volker Harry Altwasser’s The Last Fishermen, published by Matthes and Seitz, Berlin. An epic tale in which a man must face both his past and his future while he is working the last fishing grounds. He specialises in skinning spiny deep sea batfish. His daughter is also travelling on the seas and their paths meet far from Germany. A massive book full of powerful language. A translated extract is available here. 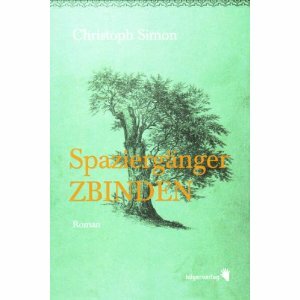 The book that was universally loved in our spring reading group in German was Spaziergaenger Zbinden by Christoph Simon – in fact, we’ll publish it next year! My favourite German literature reads are romantic tales – Mademoiselle of Scudery and Princess Brambilla by E.T.A Hoffmann and Undine by Friedrich de la Motte Fouque. I also love Herman Hesse. Nietzsche and Schopenhauer are both extremely eloquent – Thus Spoke Zarathustra and The World as Will and Representation. As for ladies – I can highly recommend Irmgard Keun and Marlen Haushofer. I agree, Spaziergänger Zbinden sounds interesting. at least I’ve never heard of it. It makes me think of Robert Walser. I read “Dearest Father” earlier this year and really liked it altough I’m not much of a Kafka friend ususally. In any case, it’s an importnat book. And so sad.